Polling shows that health care is the top priority for Americans, and that Democrats are winning among the segment of the electorate most worried about health care. POLITICO reported this week about how Republican candidates are actually running ads saying that they support the pre-existing conditions provisions of the Affordable Care Act aka“Obamacare” even after every Republican incumbent in Congress has voted multiple times over a period of several years to repeal Obamacare and voted for House Speaker Paul Ryan’s plan to convert Medicare into a private system with vouchers (coupon care). They are running away from their Obamacare repeal votes by simply lying about it (looking at you Martha McSally). ‘Just ridiculous lies’: Dems incensed over misleading GOP ads on Medicare for All. Health care keeps coming up in the approach to the 2018 midterms. And Republicans keep deceiving the public about it, because they are desperate to show that they didn’t try to strip away protections for people with pre-existing conditions when, in fact, they did. 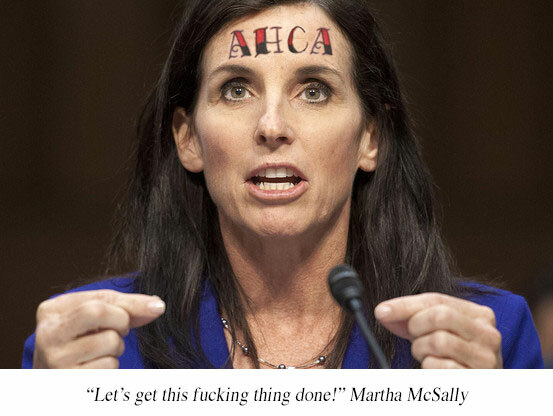 On Monday evening, it was Martha McSally’s turn. McSally, GOP nominee for Arizona’s open Senate seat, currently serves in the House. Last year, she voted for her party’s bill to repeal the Affordable Care Act, including regulations that block insurers from discriminating against people with pre-existing conditions. In a closed-door meeting on the day of the vote, McSally reportedly stood up and told colleagues that it was time to get this “f**king thing” done. One year later, the vote and the quote have become political liabilities. McSally’s opponent, House Democrat Krysten Sinema, cites them constantly as proof that McSally would leave some people with cancer, diabetes and other conditions unable to get coverage. That doesn’t sit well with voters, according to polls ― and so, when the subject came up Monday during a televised debate between the two, McSally did what so many other Republicans facing similar charges have done. McSally insisted that Sinema’s criticisms were unfair. McSally went on to accuse Sinema of lying ― three separate times. But McSally was the one rewriting history lying. There is a Republican ad airing on television accusing Kyrsten Sinema of lying about McSally’s position on healthcare, but the ad itself is another lie. McSally’s campaign is built on layer upon layer of lies in an effort to obliterate facts in the post-truth era of Donald Trump in which GOPropaganda is used to create an alternative reality. McSally, like most Republicans defending their records these days, points out that the House bill called for retaining a few of the Affordable Care Act’s regulations and some of the law’s tax credits. But the bill would have stripped away funding for expanded Medicaid, restructured the tax credits for private insurance, and allowed states to eliminate other regulations ― including the all-important rule prohibiting insurers from charging higher premiums to people with pre-existing conditions. The House Republican bill included some extra funding for states to use in other ways to help people with pre-existing conditions. In the debate, McSally alluded to this but failed to mention that, according to multiple experts, the money was not nearly enough to do the job. “It’s important to distinguish between actual support for pre-existing condition protections and lip service,” Sabrina Corlette, a research professor at Georgetown University’s Center for Health Insurance Reform, told HuffPost recently. Republicans could defend their position honestly by saying they believe pre-existing condition protections and other Affordable Care Act provisions inevitably do more harm than good. Instead, McSally and her comrades keep suggesting they want to preserve the kinds of guarantees that current law provides, even though independent analysts and experts have debunked them repeatedly. Quite possibly, Republicans figure they have nothing to lose because their supporters get information from [GOPropaganda] outlets like Fox News, which rarely scrutinizes GOP officials the way the rest of the mainstream media does. And they might be right. 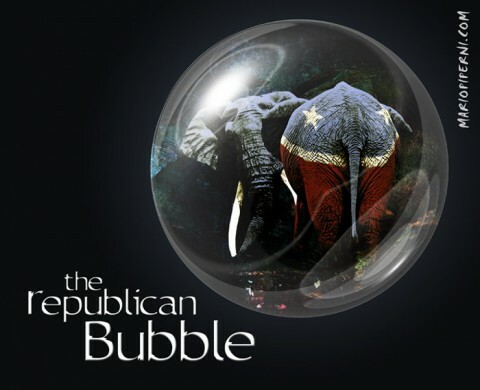 In a functioning democracy, Republicans wouldn’t be able to rely so heavily on their own supporters living inside a closed media universe [see, Epistemic closure and the ‘conservative misinformation feedback loop’ media bubble], and they would need other voters to maintain their congressional majorities. It’s just one more reason the November elections are so important. If Republicans don’t suffer electoral consequences for their behavior, they will have no reason to change. They’ll be able to keep lying about their determination to preserve access to health care, even as they get back to work on taking it away. Does anyone in their right mind seriously believe that Martha McSally would not vote in lockstep with the wishes of Republican leader Mitch McConnell? Don’t give Martha McSally or Mitch McConnell the opportunity. Just say “hell no!” in November. UPDATE: McConnell: GOP Might Try Obamacare Repeal Again If They Hold Congress: Senate Majority Leader Mitch McConnell (R-KY) said his party might take another whack at Obamacare if they hold onto their congressional majorities in November’s elections. UPDATE: Charles Gabb, the preeminent expert on the Affordable Care Act, has started compiling a list of GOP officials and candidates who are scrambling to assure voters that they fully support protections for Americans with pre-existing conditions, despite taking a series of steps to take those protections away: “Presenting The GOP Pre-Existing Condition Gaslighter Rogues Gallery!” (Yes, Martha McSally is on his list). We support Kyrsten Sinema after watching the debate. She was professional and prepared, against the hateful attacks by McSally who appeared unhinged. We need steady, strong women who have years of experience working their way to Congress. Sinema has earned our votes! We have been receiving one to two hateful attacks large post cards almost daily. We will vote out the party of Trump and the poison he and his lemmings who behave in a shameful manner that discredits America and the state of Arizona. We must do better!